StoreProgram is an easy to use e-commerce software with exceptional features and benefits for businesses with up to 1000 products and expected sales volume of up to 250 orders per day. 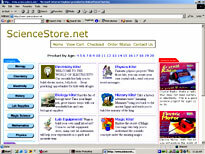 StoreProgram runs on any web server running Microsoft Internet Information Server (IIS). StoreProgram can be used for products that may be age dependent (such as toys) and products that come in verities of sizes or properties. Remote Order Processing View your orders from any Internet connection so you can prepare and ship them on time. Mark the orders as shipped and enter the tracking number. Your customers will automatically receive an email informing them about the shipment and tracking number. Multi-Level Security Security services include features that limit access to the administration section and protect the credit card information of the customers. Central Management Software If you have more than one online store, you can manage them all from one central program. Easily collect orders from all your online stores, or add a new product to all your online stores. If you are not sure weather or not an e-commerce software and online store will be beneficial for you, let us do the investment and sell your products online. You can just pay us a commission of the sales. Call to see if your business is qualified.